PerfectDisk® Pro provides smarter optimization for all your disk drives, so you can work and play faster, while reducing the use of CPU and disk I/O resources to save on energy costs. Get faster downloads, web browsing and file access, better photo and video editing, smoother PC gaming and optimal streaming media performance with PerfectDisk Pro, designed for today's power user. 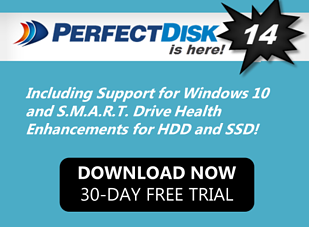 Download a free 30-day trial of PerfectDisk Pro and see for yourself! Download a free, fully functional 30-day trial of PerfectDisk Pro and optimize your hard drive for efficiency and speed. Already downloaded PerfectDisk? Get your full license today!